For families and those looking to travel around town on two weeks is the on-street bike path throughout Breckenridge. Bikers can roam around on the on-street bike path which goes around town and continues all the way to the town of Frisco, with the total of approximately 18 miles round trip. The section from Breckenridge Recreation Center to Frisco is a paved and well maintained path, designated to non-motor vehicle use only. You can start the trip from either Breckenridge or Frisco. Keep in mind that from Frisco to Breckenridge, the trail is gradually going uphill. You may not be to tell it visually, but your heart can totally feel it when you bike uphill at 9,600 feet above sea level. However, this is a practical fun trip that anyone in your family, even with small kids can accomplish. Mountain biking is another great option for those thrill seekers. Whether you are an experienced rider or not, this mountain town has every level of excitement to offer. Once the snow melts, all those vertical ski trails turn into some extreme mountain biking path, as you can imagine. 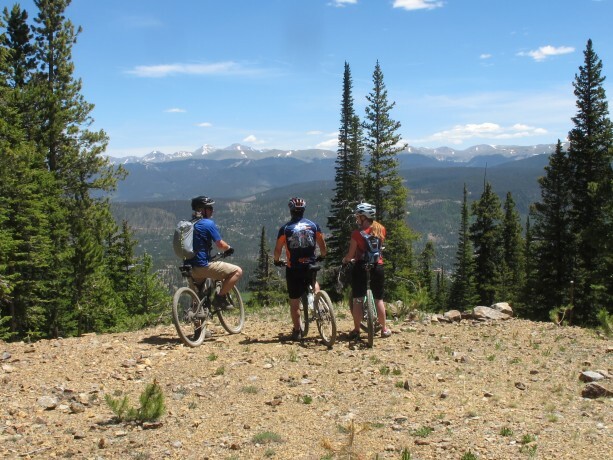 Beginner and intermediate mountain biking trails are all over Breckenridge. One great downhill biking experience is on Breckenridge Ski Area. Park your car at the Gondola lot and load your bike on the Gondola. Head up to the base of Peak 8 and let the ski lift carry you and your bike up to the top of the trails and the rest is all yours! For more information on the lessons and maps, please go to www.breckenridge.com/…/mountain-biking.asp. Another great option is Vail Pass. This trail offers the best of both worlds. It is well paved and exhilarating! This is the only paved bike trail in Colorado offering the mountain pass experience. It stretches all the way from Breckenridge to the west side of Vail. The start and finish points can vary to anywhere from Breckenridge, Frisco, Copper or Vail. To reach the Summit from Breckenridge, there is approximately 20 mile one way, with a few moderate switchbacks from Frisco to Copper. This is a very scenic trip and there are a few rest area along the way with facilities. Multiple trails and varieties of difficulties await for you here in Breckenridge and surrounding area. Don't own a bike or the looking to try something different? There are plenty of rental places in town that will fit you with a proper kind just like ski boots fitting, a bike with a child carrier, a tandem, cross country bike or trail riding bike! There is no greater experience than the ones you gain outdoors, so let’s get outside today! After you raft or zipline with AVA Rafting, spend time in Breckenride exploring amazing bike trails.